the jigger is 50 yards away . a post in the ice." depend very little on either. Raymond Ayotte was a grade 8 students at Ile a la Crosse School in 1947 when he wrote this story. Raymond Ayotte was born March 28, 1932 in Ile a la Crosse. Photos taken on Peter Pond Lake by Patuanak are from the following site. 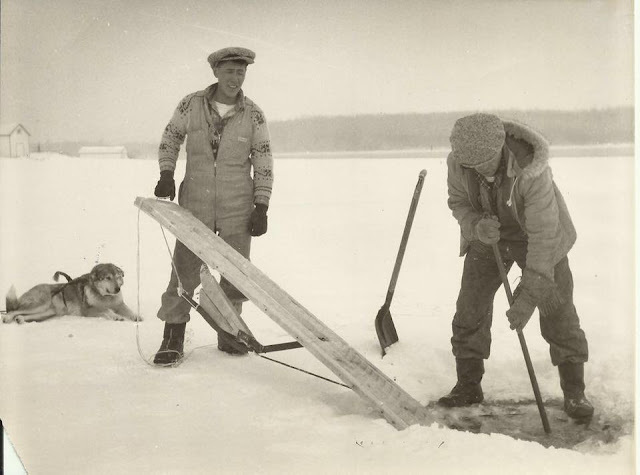 The following two photos belonging to this set were taken March 1955 on Peter Pond Lake near Patuanak. 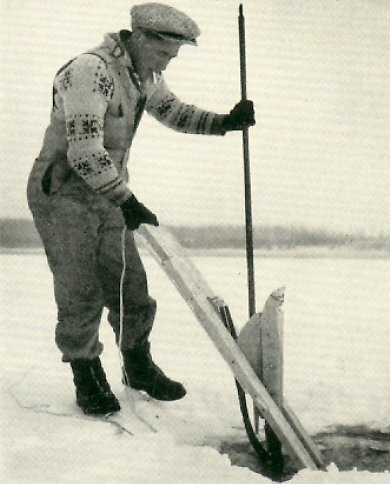 Camelia Wolveriine wrote; "That's the late Pierre Lariviere with the chisel, the other is George Campbell"
'Ice fishing' ~ (Dene) ~ Patuanak, Sask 1955 Photo: Rosemary Eaton [LAC] --- Marius Paul commented on facebook that this is on Shagwena Lake. "The jigger is a dart-shaped plank about 6 feet (1.8 metres) long. It is equipped with a steel-tipped wooden arm running through a slot and hinged to a steel rod. 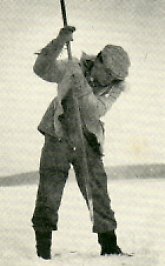 A long rope is attached to the rod. 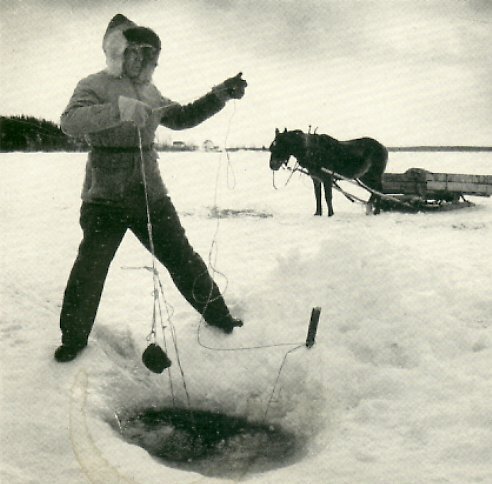 To set a net, the jigger is placed through a hole cut in the ice. 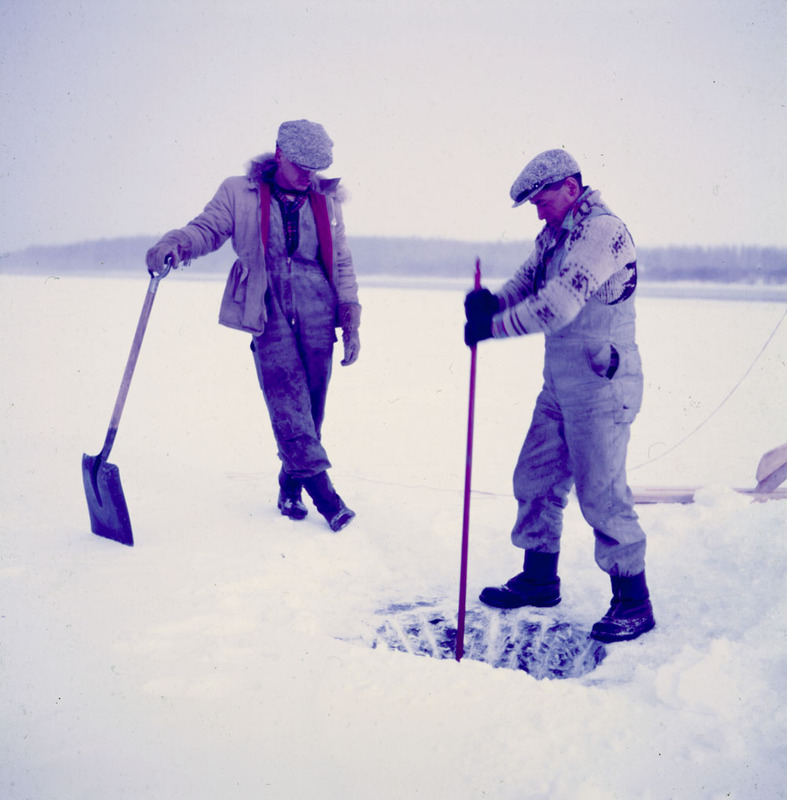 The jigger is positioned so that the steel-tipped arm sticks up against the underside of the ice at the water's surface. When all is ready, the operator pulls on the rope (applies force). The rope is attached to the metal rod (the lever) on the jigger. When pulled, the rope applies force to the wooden arm, pushing it upwards and causing the steel tip to dig into the ice and propel the jigger forward a meter or so. When the rope is released, the steel tip drops away and returns to its former position. The operator tugs the rope again and the process repeats until the jigger has moved a distance from the first hole equal to the length of the net. Sometimes the jigger can be seen through the ice, especially if it has been painted a bright colour, but usually the tapping noise made by the steel tip under the ice is used to locate it. Then a second hole is drilled just in front and the jigger with its trailing rope is retrieved. 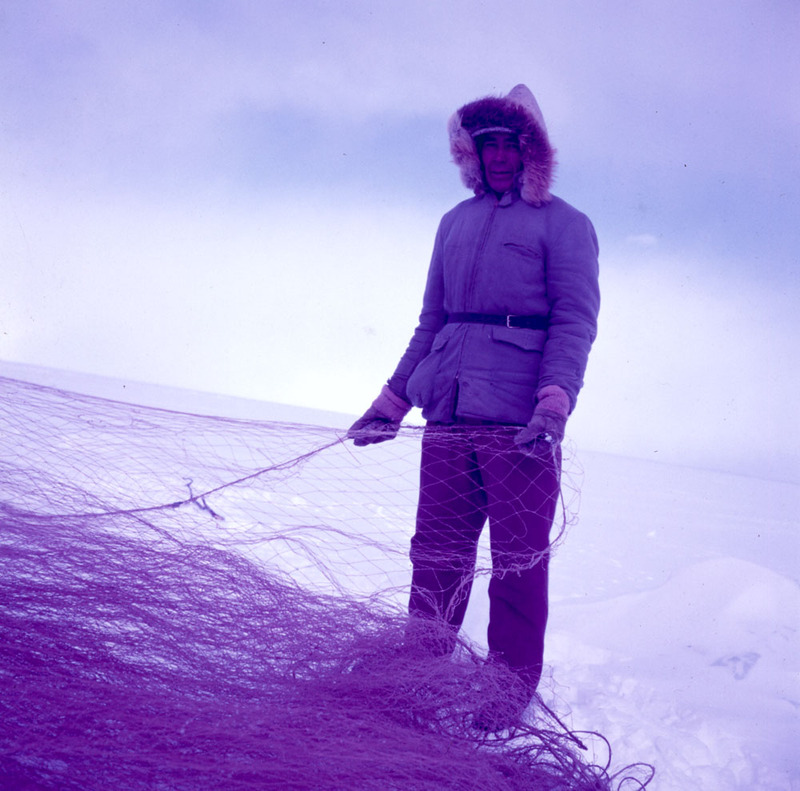 The jigger rope entering the first hole is then tied to the gill net. 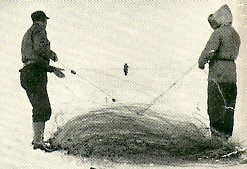 As the rope is pulled from the second hole, the net enters the water through the first hole and is pulled into position, straddling the two holes." Below are a few videos showing ice fishing with nets.